The Super Quad-20 features dual friction feeders, dual alignment tables, a removable blade cassette and a wide delivery conveyor. Using gutter-cut slitting blades, the Super Quad-20 can slit a twelve-up sheet of four sided bleed business cards without reconfiguring the blades or changing blade cassettes. Up to 30,000 three and a half inch wide business card strips can be fed per hour while maintaining hairline accuracy. Many customers are now running sheets larger than the old 12-up (8 1/2″ by 11″) card format. Using the standard Super Quad-20 with dual alignment tables, customers can run sheets up to 18″ wide. This allows up to a twenty-up business card format to be slit the 3 1/2″ way. The 45″ long delivery conveyor provides ample room for slit materials. Running an enlarged sheet size allows printers to maximize productivity especially when producing full color business cards. Need a slitter that can handle two streams of five up business card strips at the same time at a total production rate of up to 300,000 finished cards per hour? Need a single slitter with a single set-up that can product two different styles of foldover business cards at the same time? Removable blade cassettes allow various combinations of gutter-cut slitting, scoring and perforating to be performed. Cassettes can be configured to meet your specific applications. Cassette changeover can be accomplished in less than three minutes and does not require tools. Standard gutter cut blades are designed to remove a 1/16″ wide gutter. Optional gutter width blade configurations are available. 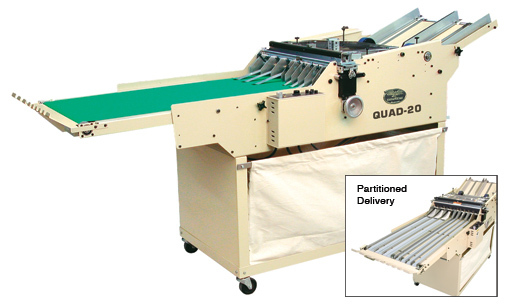 The Super Quad-20 is the only high speed slitter designed to handle large format standard and odd size, foldover and bleed business card production. Ideal for special application work, the Super Quad-20 can be configured to meet your specific production requirements.